The TRS-80 Model 102 - The Tandy Model T! Tandy 102 "The Model T"
When I was a youngster growing up, there was a computer that intrigued me. Unfortunately it was hideously expensive. Also when one thinks of my disturbing obsession with my PalmPilot, my interest in this computer was a scary precurser for my sad, sad life now! This computer shared alot of the similarities with the PalmPilot now. It has an Address Book, a built-in Text Editor, an Appointment Book. What it had that a PalmPilot doesn't is a built-in modem (at a frightning speed of 300 baud), & a full travel keyboard. It also only had 24K (expandable to 32K) & an 8-bit processor! Chuck in 20 hours battery life on 4 AA batteries & you can start to see its advantages over modern laptops. This computer was released in 1983, and a thinner, lighter model was released in 1986 (with no change to the hardware). Time marches on, and this computer is no longer worth the NZ$1690 it was in 1987. In fact they stopped being made in 1991. What is the name of this wonderous little computer? Its name is the Tandy 102! It is the only Microsoft OS computer I currently own! So how on earth would one get hold of something so old? eBay of course!!! For US$25 I recently picked one up. If you want a Tandy with more guarantee's about its ability to function, then buy a reconditioned one from the Club 100 site. It is a magnificent little machine! NEC8201 Site. Site has what was the "M100SIG" library on Compuserve online. Just how useful is the Tandy 102? Well for starters everything I have written so far on this page was on the Tandy and transferred to my Linux desktop using Minicom and the XModem protocol! I've even posted a review of my Tandy 102 on the Gadgeteer site here or click on logo below! If you want to support Club 100 , then buy some branded merchandise from the CafePress.com store! I brought the T-Shirt & its great! 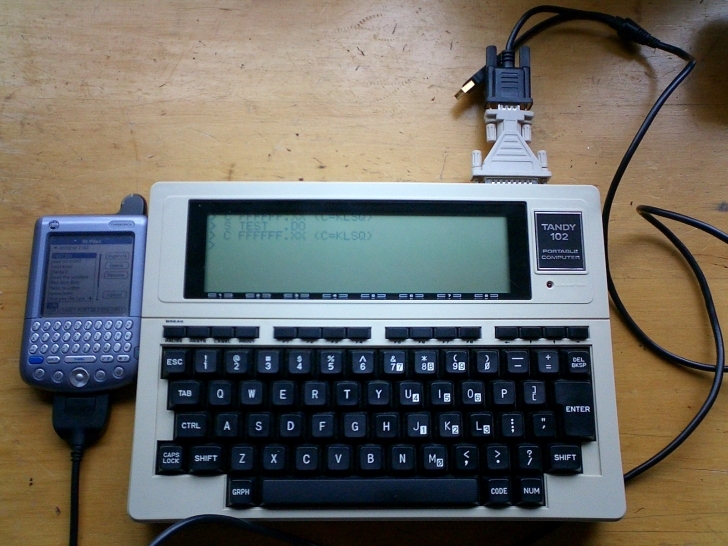 Thanks to a wonderful new project called Bitchin100.com , it is now possible to transfer files between your Tandy & your Palm using Teeny! The application is called DLPilot. At the moment the application is in alpha production. But it does work believe me! A small amount of money is being charged for it at the moment. Once officially released a small upgrade cost will be charged. Well worth the dollars I think! Eventually the author is going to release the source code under the GPL agreement. Essentially you just use Teeny as you would normally! I connected my Palm Tungsten W (USB) to my Tandy 102 (Serial) using the m500/m505 Y-Cable cable brought from brando.com. Also a 25M->9M port adapter. When transferred, the files come through in the standard Palm DOC format so editors like SiEd can view/edit the transferred files. As you can see, the Tandy 102 is a remarkable little computer. Considering it is nearly 20 years old, to think that it can still interface with so many modern PC systems, and still be useful, speaks volumes for its design. It was definitely way ahead of its time.